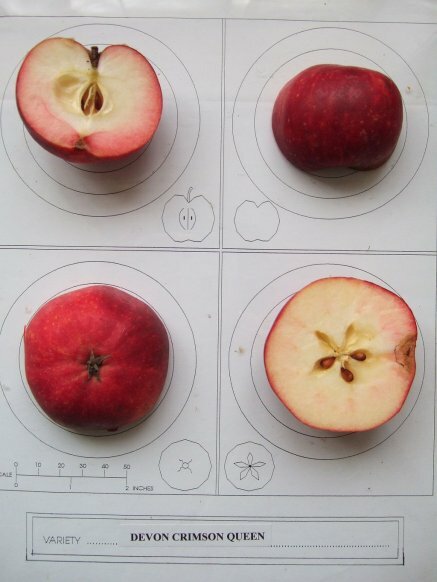 Fruit: Shape –flat round, ribbed, medium to large size. Skin – yellow/green with large prominent grey lenticels, slight russet around stem or eye, complete dark red, short and flecked flush. Flesh – greenish, crisp and juicy Flavour – sweet with a tang, pear and honey overtones. Aroma – fruity, aromatic and delicate. Uses: Dessert – sweet with a slight tang. 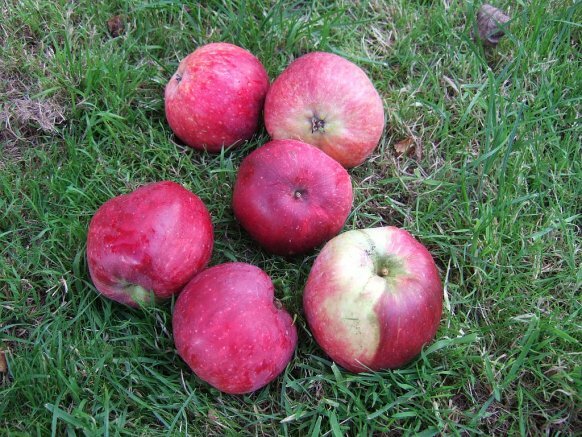 Culinary – N/A Cider - useful in blends. Juice – pink, rather bland, best served chilled. Recommendations: Attractive red fruit especially when on the tree. Flavour and texture short lived. This variety does not completely equate with Jonny Voun, the flavour is slightly different, so is probably a sport of Sops in Wine.